I never knew shopping at Borders during the holidays could be the new thrillseeking experience. Pulling into the parking lot, I see cars attempting to exit backed up deep into the underground structure, the occasional driver creeping over the center divide to face oncoming traffic, trying to peer ahead to figure out what is causing the departure holdup. I am the face these daring drivers encounter under the ‘oncoming’ label, requiring me to demonstrate precise driving skills in order to avoid a holiday season, head-on collision. While a quick calculation informs me that such an accident would raise the interest in the ‘Guess what happened to us this year?’ greeting card enclosure (if I actually did one), I decide to opt for safety over drama. I move slowly and cautiously and snag a primo parking space thanks to my remarkable parking karma that materializes spots just like the onscreen movie-parking phenomenon. Entering Borders, I can’t help but notice the lengthy line awaiting checkout. Holiday shopping in full swing. And I’m actually glad to be a part, having left my bah humbug home with my dog who has buried himself beneath covers seeking shelter from the recent chill that has arrived beachside, the kind of chill that will never make national news because no one much cares about the impact of fifty degree weather on thin-skinned Southern Californians. I wander the store wrapped in wool coat and scarf fulfilling my consumer duty of impulse purchases from the bargain table. What thirteen-year-old boy doesn’t need to learn to juggle? Or a hardbound, black spiral notebook of staff paper for the budding composer? But of course. Ooh, I spy a book for mom, and the year’s running out so best pick up a new wall calendar. I arrived as chauffeur to a son in need of wheels and will leave as a sherpa. But oddly, I am enjoying myself. I feel as if I’ve joined the club of revelers and celebrants. My cynicism is off hiding as I stand inoculated against its snarkiness by commercially packaged holiday cheer. In order to not be late for a dinner reservation, my eyes dart from the check out line to my watch. I’m cutting it close, so I slip behind the other eager purchasers in line. From where I stand, I can barely see the cash registers, but my anxiety over the time is quickly refocused because Borders is not run by fools. All along the check out line are tables of additional potential impulse purchases. Held hostage and in shopping glee, I pick up a book on how to combine Hanukkah and Christmas celebrations as if my family isn’t lifetime masters of the practice. “We could get this for Grandma,” I say to my son. The book shows menorahs of candy cane candles and displays matzoh balls as snowmen. It’s kitschy enough to nearly mandate a purchase. But as I consider adding this book to my pile, the line picks up and starts moving. I toss the book back on the table, saved from a purchase I would definitely regret. A Christmas miracle…or is that Hanukkah? “Look, just like Disneyland,” I say to my son, but it is the woman in front of me who laughs. Borders smartly plays us again. The sign works, for I instantly stop worrying about the length of the line. My body posture relaxes. I no longer feel rushed. ‘We’ll make dinner,’ I tell myself, believing the sign. Borders has sold me trust and optimism. But I must question, did anyone really clock the wait time from that spot? Imagine a Borders’ employee, stopwatch in hand, calculating the exact place in line where five minutes would occur. How likely is that? But it doesn’t matter. I am so touched that Borders wants to calm us – and prevent bitching and moaning, not to mention a shoppers’ riot in its store – with this magical little sign, that I can’t stop smiling. When the line speeds ahead, I celebrate Borders’ accuracy. It was definitely less than five minutes. In front of the cashier, I feel as if I’ve fully crossed over into holiday spirit. It may not be as exciting as climbing into a car for Space Mountain, but it’s not a bad place to be. My iPod woke me during the night as if it needed to tell me something. At first I wasn’t willing to listen, disturbed by the call to wakefulness via a tune playing from speakers across the room. I saw the glowing light of the iPod screen announcing its operational status. Still disoriented by sleep lingering in my body, I reached for the tiny remote sitting on my nightstand, fumbled over the buttons, and hit 'off.' I set down the remote and rolled over, eager to return to dream state. Within seconds, the music started up again, and once again I reached for the remote. I clicked 'off,' and before I could even place the remote back on my nightstand, the music started again. Like a comedic tug-o-war, I repeatedly hit 'off' and the iPod repeatedly rebounded to life. It was not to be silenced. I stood in a huff and marched towards the device, pulled it from its speaker base, and laid it flat on my TV stand in a triumphant ‘Take that!’ I returned to bed and slept through the night till morning. Had the evidence of the horizontal iPod not greeted me when I woke, I might have thought my memory of the incident a dream, but there it was, lying prone as if knocked out, unable to move. I kind of felt sorry for my dear iPod – it looked helpless and rejected – but it had disrupted my sleep, which I consider rude and insensitive. “‘I Am a Diamond’ by Antigone Rising,” I replied, and as the words floated towards my son, my eyes unexpectedly started to tear. “Which song is that?” he asked. The disk sat in the CD player of my car, so I turned on the car stereo and found the right track. “I am a diamond and I cannot be broken…” sang the car speakers. I spent the next five minutes trying not to cry in front of my son as I motored him to school. After dropping him curbside, I drove off and returned to the top of the track. I played it three times before pulling over for coffee. My iPod had been trying to speak to me, and I just didn’t want to listen. I exerted all my effort to keep the message away, a message that should become my mantra. Lately I have felt very broken, inexplicably broken, the kind of broken that no one else can see or feel. Music reached out to me in this way once before. The night of my stepfather’s funeral, I came home, crawled into bed, and thought, “How can I best help my mom?” She was feeling very broken, paralyzed by sudden loss. As the question completed in my mind, a tinny little piece of music started playing somewhere in my bedroom. I sat up, looked around, unable to identify the source. The sound drew me towards a chair against the wall, a chair used as my depository of stuff. The drop zone. A few odd items lay on the chair, and the music seemed to be coming from beneath them. I burrowed through the pile and found a tiny, windup music box, a replica of a wrapped present adorned by images of butterflies that my mom had passed to me to play for my infant son. It housed her favorite song, Edelweiss from the movie The Sound of Music. I hadn’t seen the music box since depositing it on that chair the previous year, evidence of the out of control state of my room. I didn’t even know it was there. For it to leap to life after being untouched for a year was quite startling. In order to get it to play, one must wind the little lever on the bottom a few times, and when it runs out of juice it stops. There is no on/off switch. That night, without calculation I thought, “She should start taking piano lessons.” I can’t say why that came to me. My mom hasn’t played piano much since my childhood, but a baby grand occupies a big chunk of her living room, mostly as a stand for framed family photos. With the butterflies on the box – the symbol for transformation – it was all too neat and tidy for my rational brain, yet it felt so true that I didn’t question it. I told my mom of the experience the next day. She nodded, listening, trying to hear. This incident took its place behind a long list of mystical things that had happened since my stepfather’s funeral. Now, eleven years later, my iPod is talking to me. I can attribute it to chance or coincidence. Perhaps a neighbor with an extraordinarily powerful remote on the same frequency hit play. Perhaps the iPod was coincidentally parked on that song. Anything is possible, but it doesn’t really matter, because in my fully awakened state, I am finally listening. And the next time my iPod leaps to life on its own, rather than seeking to silence it or figure out how it happened, I plan to lie back and take in the words. I don’t know why The Avalon is presumed to be a more appealing name than The Palace. Apparently, new owners think renaming the nearly eighty-year-old venue whose marquee has displayed a series of names reflecting Hollywood history through the years – but has been called The Palace since the early 70s – is a smart move. Or maybe these owners just wanted a chance to stamp their own mark. In the least, I know that renaming is a trend. A disturbing trend. The Irvine Meadows is now the Verizon Wireless Amphitheater (doesn’t that just roll off your tongue?) Candlestick Park is now Monster Park. When can I start screaming? What’s the point of a name if not for identification? Oh, right. Publicity. I understand as arenas pass from one owner to another, the company buying the locale wants its name on the marquee for advertising power. Great. We remember your name but have no idea where we’re going. The benefit of that is what exactly? Can’t you buy an arena, keep the name, and just plaster your banners everywhere inside? Oh wait, the plastering happens anyway. Do you not understand how we mock you as we watch musicians onstage and see wireless ads on every surface in the room? Do you not understand how this annoys us and may prompt us to switch to a less intrusive competitor (if only one existed)? How’s that for a marketing campaign: We bought the arena, but left the name intact. Talk about a new fan base. That’s it. We could start auctioning off our kids as real estate, a new way to procure money for the college fund. Sure it would be confusing if three PacTel’s registered for kindergarten, only to register in second grade as Airtouch (a much better name, I might inject), followed by Verizon two years later (the name evolution of my cell provider due to mergers and acquisitions), but hey, if it’s to make a little money, what’s the big deal? While I can tolerate the merger and acquisition name changes much like I make adjustments for marriages and resulting hyphenates and adoptions, I still can’t accept the disregard for the historic value of venue names and the lack of understanding of ‘a time and a place for everything.’ I’m happy to have a cellphone under the Verizon label, but I much prefer to visit a venue with a more romantic name. I need not be reminded during every journey of the corporate sponsorship of the world. These name changes paint over the past and rob us of a connection to history, relegating it to the results of Google searches. If a small venue on the verge of disappearance changes its name in an attempt to secure survival, I can understand, but when a corporation imposes its name in an act of self-promotion – even if it paid for the right – I see the behavior as brazen and disrespectful. The practical side of me wants a solution as to how to impact corporate behavior in this arena (pun intended.) If mockery alone could succeed, I’d lead that revolution, but these corporations have a very thick skin. And we can’t launch boycotts of the venues, for if ticket sales drop, the company will just sell off the arena prompting yet another name change (ouch). As a romantic, I have wistful thoughts more than concrete solutions. The best I can come up with is self-serving acquiescence. I have a very talented musician as a son. He's lusting for a new electric bass for Christmas, and I see a baby grand piano in his future. In order to facilitate these dreams, I think I could get used to calling out ‘Ibanez!’ or ‘Steinway!’ when seeking help with the groceries. It's hardly a solution, but this way I can send my son to college, and maybe with the help of a fine education, he can come up with a solution of his own. There are three kinds of people in this world, those who see a problem and imagine a glorious solution and are energized by the vision; those who see a problem and feel despair and crawl into their cozy corner and hope it goes away; and thirdly, the ones who won’t even look at the problems, who won’t consider their existence, for the thought of such existence inconveniences their lives. Jen and Mad fall into the first category. They take charge, plunge forward, elicit the aid of others, and look to stimulate change. They have the ability to start a movement, and results follow behind them like fans of the Pied Piper. I teeter between group one and group two, often exhibiting the qualities of those who get overwhelmed by all the social injustice in the world. During certain sprints of action, I can reach out, speak, organize, and hope, but then I must go back to my corner and recharge. I feel the world’s pain so deeply that I ache, and I can’t always come forward and act. So today I toast Jen and Mad for their relentless pursuit of justice, for their eternal strength in seeing the possibly that lurks behind the despair, for knowing that ‘enough’ is what most of us have, and ‘not enough’ is what most of us do. But rather than giving up on us, this lovely couple has called us to action to fire up the part of us that believes. And I propose that in honoring their union, we don’t leave the reception feeling that we’ve done enough, but go back to our lives remembering the call to duty, to look for the little ways during our daily routines where each of us can try to improve the world, to make it more just and more equitable, to take a moment to help someone suffering or to speak to the defense of others in need. We need not turn our lives upside down to accomplish this goal. We need not be full-time aid workers. We can simply be hopeful inhabitants of the planet, those who can imagine a better world. The nicest man I’ve met in months – maybe years – came to my home to kill cockroaches. The irony is not lost on me. Only one roach at a time has appeared in my home, usually late at night when on a whim I return to my kitchen with a snack in mind and flip on the lights. Nothing kills a late night craving faster than seeing a little cockroach scurry across your kitchen floor. At first I lived in denial, convincing myself that a single stray had found its way into my home. I killed it and felt relief. Then a friend and her husband came for dinner, and another roach got wind of my impromptu feeding and decided to make an appearance, a profoundly disturbing addition to any dinner gathering. “I had a mouse here once,” I started. “Okay, enough of this,” my friend jumps in, the calm in her voice gone. Not only are the roaches back, they’ve decided to expand their sightseeing. While I certainly wish my neighbors had acted upon their infestation when it started and kept the little buggers from paying me a visit, complaining won’t help at this point. I call the pest control people and schedule an appointment. Today Oscar arrived. I have never encountered a cheerier man, which only proves that the quality of your life is not based on the quality of your job. He kills bugs for a living – probably mice, too – and walks into the room as if he’s the most blessed person on the planet. He played with my dog and talked about growing up in this neighborhood, revealing that his brother had been shot and murdered twenty years ago about six blocks from my home, prompting his mother to sell their house. He shared this information with a neighborly casualness, not one to wallow in past pain. So while Oscar arrived to kill the creepy crawlers in my kitchen, he waltzed in and killed my sour mood, the one that took root after an unpleasant family reunion for Thanksgiving, the day I was to honor all that is good in my life, but instead, having celebrated amongst the whiny and the depressed, only served to take me down to their level. For two weeks I’ve been trying to bounce back. I’ve made mental lists of all I appreciate. I’ve read books to alleviate my mood and get me away from myself. I’ve strolled in the sunshine and cuddled with my loving dog, the dog that yesterday appeared to sense my sadness and crawled upon my lap and rested his head on my chest as if to say, “I know, I know. But I’m here for you and I love you.” He didn’t demand his usual midday walk that invariably interrupts my most productive moment. He didn’t cry for a cookie. He didn’t place his needs before mine. He just stayed close, maintaining body contact with me for hours as if trying to infuse me with good energy to push out the bad. But despite all these efforts, my sadness remained. I thought of my mom’s question as to whether I would be hosting Christmas morning again this year, the question I sidestepped not wanting to sound snarly and cynical. But when Oscar the roach man came today he began to exterminate the lingering gloom. He brought little traps that he hid in the backs of cupboards, out of sight, but there to serve. And as I recline comfortably with my dog still pressed to my side, I picture my residue sadness lured from my body, migrating towards those traps, getting stuck, unable to come back to nag me. I picture Oscar returning as promised in two months to remove the used traps, my home pest free, his carting away the captured pain and poison. I picture him rubbing my dog’s head and shaking my hand as he moves out my door. And I picture myself Christmas morning wearing a smile, sitting with just my son and my dog, or maybe with an invited friend or two, fresh baked muffins cooling on the counter, a shining California morning streaming through our glass doors and our high windows with views of the ocean. I picture the presence of joy and the absence of sadness, and I picture Oscar surrounded by love. Thank you, Mr. Roach Man. You are my angel. The fences have gone up, the annual act of man that signifies the approach of winter in my beachside town. 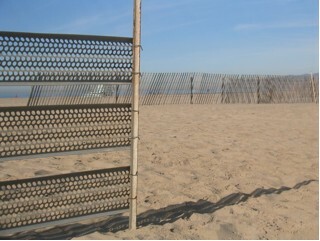 The waif-life barriers magically block the migration of sand towards the boardwalk, leaving the beach intact and able to withstand the assault of high tides and aggressive waves. Much is made over the nearly identical year-round weather of Southern California, but these fences attest to our climate changes. Every year when the fences arrive, I know the ocean is getting ready to roar. And every year when the fences are pulled up and tossed into the backs of trucks, I know our moderate winter is over. 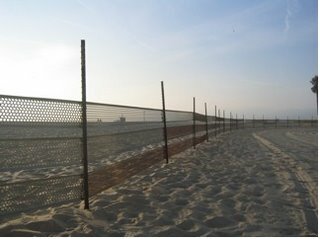 How fitting that these fences actually look like markers stuck delicately in the sand, hardly seeming like a potent force against a storm. But they serve to protect us year after year. And they serve as a marker of time, an indication that another year is rolling by. The skies often grow darker around the time the fences go in. We might still have an unseasonably warm day, the kind that makes Easterners move west after watching the Rose Bowl on TV where we’re all dressed in shorts while they must don snowshoes and winter coats to dig their cars out of the driveway. But despite this national advertising, we do have winter. After the fences go up, Venice grows quieter. Only locals stroll the boardwalk walking dogs and staring out on our beloved view of the ocean. We live the shorter days and the grayer skies, the cooler weather that requests a sweater and maybe even a scarf. We even wear closed shoes. We move more slowly assuming a subdued mood. Hopeful vendors still line the boardwalk, though they often let days go by where they stay away. As the season progresses, my dog’s walks grow shorter, his thin coat leaving him to shiver, his stubbornness refusing to wear a sweater. I most often walk on the sand in the winter. The solitude is meditative, the beach more personal in the cold, a place of reflection rather than a playground. Nature’s sounds dominate those of humans. The sky poses dramatically for photos, punctuated by clouds and colors that get washed away during the bright heat of summer. But this year it’s different. Eighty-degree temperatures arrived after the fences went in. Fresh crowds arrived in skimpy clothes moving with playful strides. And the fences stand as if they have nothing to do, no purpose to serve. The skies stay bright and sunny. The sea stays calm. The fences feel embarrassed. I know it. I know they’d rather be lying around than standing falsely at attention like military police sent in to quell an anticipated student uprising. Such cops stand tough and strong and secretly wish they were on their couches watching a game or playing with the latest video invention. Their opposition doesn’t warrant their arrival. Their opposition is just flexing. And while it’s possible that things could abruptly turn ugly, just like a storm could suddenly hit the Southern California coastline – the only way our storms seem to arrive, sudden and on the heels of hideously hot winter weather – to lurk around, to wait for such an occurrence, feels pathetic, an act of wishing for exactly what most hope doesn’t happen. Your presence feels as if it’s inviting disaster rather than protecting against it. In the quiet, the fences turn their attention to each other. Where Venice meets Santa Monica, the fence styles change. Venice’s are metallic and tough reflecting the historic posture of the city, while Santa Monica’s are casual and wooden reflecting a lack of concern. 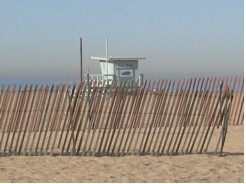 While Venice is growing in wealth, Santa Monica still has the upper hand. You’d expected the newness and the shine to live in the more affluent city rather than in the Venice of aged grit and decay, a decay that itself is decaying and being replaced by shiny and fresh and recently built, transitioning Venice from its place on the fringe to a desire for societal respect. At the border, the two styles of fences look at each other deciding whether they can be friends or whether they must stand as foes boasting of the respective assets of the cities they guard. They can’t help but assume the competitive posture, for they’ve been bred as guardians, as protectors, not as friendly welcomers. 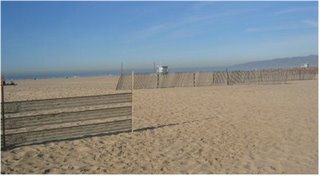 But after some time, the fences of Venice and Santa Monica realize that on the quiet days, they only have each other, that they can boast and strut, but the reality is that they share a common goal. They both want to go home early, assume a cozy spot on the couch and share a few beers with friends. They don’t want to stand in wait. And when the season ends, they may even decide to grab a meal with one another. After all, they have a lot in common, and it would be a nice way to spend the off-season. Meanwhile, I'll wait for winter to arrive, my coat hanging by the door ready for duty.